16th Annual Kids Bike Swap! 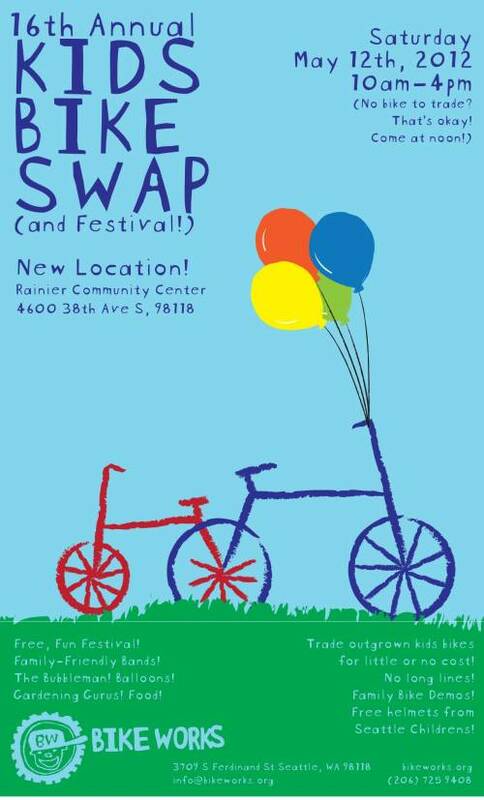 Bike Works will hold its 16th Annual Kids' Bike Swap on Saturday, May 12, 2012, from 10am - 4pm at Rainier Community Center, 4600 38th Ave S.
This event is an opportunity for families to trade in a bike their child has outgrown for a larger bike – just in time for the summer riding season! The Kids' Bike Swap helps to facilitate the flow of affordable bicycles within the community and keeps fully functional bikes out of our local landfills. Bike Works staff and volunteers have been hard at work all year refurbishing used bikes to bring to the Kids' Bike Swap. On the day of the event, families can bring bikes that their children have outgrown and the bike is assigned a trade-in value. The families can then look through all of the bikes we have fixed up and pick out a new bike. The trade-in value can then be used to deduct from the cost of their new bike. (If the chosen bike's value exceeds that of the trade-in value, the customer is responsible for the difference.) Typically, when a bike is swapped the customer is able to take home their newly refurbished ride for $20 or less. Families looking to buy a bike, who do not have a bike to trade in, are welcome to shop for a low-cost bike after 12 pm. Join the hundreds of other families participating in the Kids’ Bike Swap! To make things even better, this year there’s no need to wait in line. Families can drop off their trade-in bike and enjoy all sorts of fun activities until their number is called. In addition to the Bike Swap and bike activities, all families are invited to join in the festival, with kid-friendly bands, balloon animals, gardening tips, food and much more! There will also be a Family Bike Expo, with examples of different bikes and trailers that allow families to be car free. Admission is free and everyone is welcome at the festival. You don’t have to bring a bike to join in all the activities. Seattle Children's will provide helmet fittings and free bike helmets, as well as provide education on bicycle helmet safety.